Certain astrological patterns occur universally — that is, everyone gets them at approximately the same age. 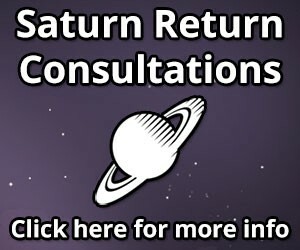 One of those astrological patterns is the “Saturn Return” which occurs when transiting Saturn (where it is in the sky now) returns to the same position in the zodiac which Saturn occupied when you were born. Everyone experiences a first Saturn Return around age 28-30. During transition periods, people reappraise their lives, leave the old, begin the new. Sometimes the changes are quite far reaching. The transition periods identified by psychology correspond neatly with major transiting (astrological) patterns. Levinson stressed the “Age Thirty Transition” and “Mid-Life Transition” as the most universally experienced of these crisis periods. The “Age Thirty Transition” corresponds to the first Saturn Return (which occurs around ages 28-30). Astrologically, the issues center around time, structure, responsibility, power and accomplishment. One common experience is that people suddenly feel “old,” perhaps for the first time. “I’m almost thirty,” the inner refrain goes, “and what have I done with my life?” A sense of time passing emerges, with more urgency to accomplish something lasting. People are likely to examine their lives to date and judge their achievements (or what they see as lack of achievements). How much, how little, and what kind of responsibility and power the person is wielding become a focus for examination. Typically, people who have been carrying too much of the load, overdoing responsibility, will look for ways to cut back. People who have been avoiding responsibility may be forced to be more grounded, or willingly take on additional tasks and power in order to gain the achievements they desire. (2) Individuals who have not really settled into a life structure, who have been experimenting, or wandering, seeking and searching in their twenties, will feel the pressure of time. A group of them will make their first real commitment at this point. They will settle into a career (as opposed to “just a job”). They will get married. They will select a life structure which gives them a sense of stability, but fits what they’ve learned about themselves through the years of “trying on” different things in their twenties. They will set their sights on accomplishments, and be ready to really dig in, building a foundation for the future. (3) Individuals who have also searched in their twenties, but not developed skills, self-confidence, or necessary expertise, may continue to flounder. They will also feel a sense of pressure, of time passing them by, of wanting to do something that will last — that will make a “real” difference. Without adequate preparation or commitment, however, they tend to end up feeling blocked and frustrated. Nothing really works for them. Nothing comes together. Their efforts seem futile. To escape this trap, they must go back, build up their skills, competence and willingness to be practical about responsibilities. They have to take more time to catch up with their peers. (4) Individuals who have chosen in their twenties a life structure which is not very suited to their character, or who have simply changed a great deal, will make breaks. The old ways will feel confining, limiting, restrictive. Old patterns of behavior seem formalized and lifeless. In such cases, the people involved may end relationships, quit or be fired from jobs, move, or otherwise alter the basic structure of their lives. Sometimes they break out before they know what they are going toward. They simply know that they cannot continue to work with the current design. After (or while) making their breaks, these people will actively seek a firm commitment. They will look for life tasks which will provide them with a sense of achievement, mastery and competence. They will seek out responsibilities that will help them to feel they are making a real contribution and gaining expertise. Of course, some people will do a mixture of these four, generalized paths. They may build, advance and solidify their family life, while making major breaks in their career (or vice versa). Each individual will meet the “Age Thirty Crisis” in his/her own way! What kind of a career am I temperamentally suited for? If I died tomorrow, what would I like to leave in the world? What kind of person do I want to grow old with as a mate? Do I want the responsibility of a family? How much responsibility am I willing to take on? Where am I feeling burdened, restricted, confined and limited? How can I change my life to feel competent, capable, expert and in charge (rather than burdened, etc.)? What skills have I developed through my life to date that I can put to work in the world? Am I still living out the “shoulds” and “shouldn’ts” of someone else (parents, teacher, partners, etc.)? If so, how can I be truer to my inner essence? How, where, and to what, do I want to make an enduring commitment? If I view this as a time to lay a foundation, what is it I would like to build in the next six to seven years? Once people master the Age 30 Transition, they enter a “stable period” (in Levinson’s terms). Stable periods usually last six to seven years. (Seven years is one quarter of a Saturn cycle, astrologically.) During stable periods, people build life structures, elaborating foundations they have already set. If you are near the Age Thirty Crisis, take a look at your life! You are not as old as you may feel right now, but you are making important choices! Examine the structures you have set up. If they are too restrictive, make healthy, productive changes. If you’ve been avoiding commitment, examine your options and select a course that will allow you to begin building a foundation for the future. If you’ve already selected with wisdom beyond your years and are reaping rewards, acknowledgments and support for your current path — congratulations! You’re one of the rare few who sail through this transition with few flurries. If you’ve been too experimental to make choices, you can now choose to prepare better for the years ahead. Your challenge, during the Age Thirty Transition, is to take on sufficient responsibility to achieve a meaningful, measurable result that will last — but not so much responsibility that you are overburdened and overworked. Your challenge is to commit to a person, a career, a family or some basic life structure which will enhance your own personal growth as well. Your challenge is to identify what you can contribute to the world — your unique gift(s) — without feeling overwhelmed, inadequate or helpless. Your challenge is to identify the basic rules and laws of life, to work wisely and well within them, and to accomplish as much as you can to create an enduring testament of you having lived on this planet. Some of that enduring testament may be an outer (career) achievement. But the most vital part is your personal growth, maturity and increased mastery of your life and being. On the most basic level, your major task is to consolidate all your experience to date into an increased expertise at living, loving, growing and managing your life with common sense, with foresight and with concern for the greater good.